It’s bathtime! This may either have you excited or very worried. But don’t fret, bathtime doesn’t have to be frightening. 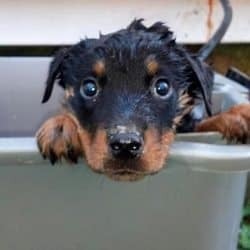 I’ve made a step by step guide to bathing your Rottweiler puppy so you will know exactly what to do. First, you will need to prepare for your bathing session. Remember, this is new for your puppy, so they may be frightened, and to make it less scary for them, we should prepare them the best that we can. Place your puppy in the sink or bathtub where you will be bathing them. Get them used to the idea of being in there and get them comfortable. You do not want them to be fearful of the area you are going to be using for bathing. Run the water and get them used to the sound. The sudden sound of the water can be scary for a puppy, so we want to make sure they are not frightened when we turn on the water. While you have the water running, try getting their feet wet so they know what to expect first. Make sure you purchase dog shampoo. Human shampoo is not good for your puppy’s skin or coat. The shampoo they make for dogs is specially formulated for their skin and coat, so always use dog shampoo. Let your puppy smell the shampoo so they are familiar with the scent. 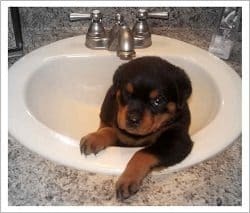 If your Rottweiler puppy is still very small, I suggest bathing them in a sink. A bathtub may be a bit large, and it may be easier for your to bathe them in a more controlled environment. You may want to place a bath towel in the bottom of the sink or tub before bathing your puppy. You do not want your puppy to slip in the sink or tub and get hurt. Especially since they may be nervous and try to get away from you. This way, they will have better footing and if they do happen to fall, they will not hurt themselves. When it is time for your puppy to get a bath, it may seem silly, but make sure it is a quiet time in your home. I suggest if you have children, to bathe your puppy when they are not home. 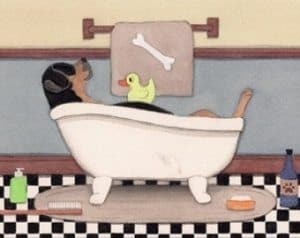 As ridiculous as it may sound, you want to make sure your puppy does not feel like they are being punished or teased during their bath because this will only add to the anxiety of bathtime for your puppy, making it increasingly more difficult on you for future bathtimes. You may even want to play some quiet music for them to make it more relaxing and calming. It is very important that you always remain calm yourself. Your puppy looks up to you as pack leader, so if you are calm, they will be calmer as well. You can use any method to remain calm that you need to. The important part is to be relaxed. Wear clothes that you don’t mind getting wet and dirty. You’re probably going to be giving lots of wet cuddles during this bath to help your puppy stay calm so you want to be prepared to get wet yourself. Also, your puppy will probably shake off at some point, maybe even several times, and you will probably get splashed. You will definitely have wet clothes and a wet bathroom afterwards. Just prepare yourself for that by making sure you have an extra towel to wipe down your bathroom afterwards. Try to prevent distractions that may occur during bathtime. Turn off your phone, or put it on silent, make sure you don’t have visitors coming by, and don’t decide to bathe your puppy while you are currently doing something else that needs your attention, such as cooking. It is not safe to leave your puppy unattended while bathing them. Make sure the bathroom, or room you are bathing your puppy in is warm. We all know how unpleasant it is to step out of the shower when it’s very cold, and we want to prevent as many unpleasantries as possible. Dogs, and especially puppies feel heat more strongly than humans do. Make sure you do not bathe them in water that is too hot for them. Keep it at a comfortable temperature, around 100 degrees fahrenheit is just about perfect. Test the water like you would for a baby with your wrist or elbow to make sure it is not going to be too hot. If the water feels warm enough for you yourself to bathe in, then it is too hot. And make sure you fill the tub or sink to half the height of your puppy. You do not want to risk accidentally drowning your puppy! After filling the tub, sink, or whatever you are bathing your puppy in, make sure you bring a plastic bowl, jug, or cup with you. You will need this to fill up with the bathwater and pour onto your puppy. Also, it couldn’t hurt to bring in some treats or dry kibble as a treat for your puppy. Make sure they are kept a safe distance away from potential splashes. Take your puppy out to go potty first before you begin the bath. The sound of the water, and then being submerged in it may be too much for them and they may go to the bathroom in the water. This is incredibly counterproductive when you are trying to bathe them! If this happens, do not panic or get angry. It is going to happen from time to time. Just remain calm and refill the tub if need be. When you are ready, call your puppy in for their bath. It is not uncommon for your puppy to pick up on what you are doing and may run and hide, so sometimes it helps to get them tired first. Maybe take them for a walk before the bath so they are tired and indifferent. Got them into the bathroom? Good! Now, close the door! You don’t want them to be able to escape. Once in the bathroom, cuddle with them and make them comfortable and relaxed. Now you are ready to bathe them. You will want to gently immerse the puppy into the water. Make sure you keep their head above the water and get their body wet all over. Make sure you talk to them softly and give them treats and praise when necessary. Pour a small amount of shampoo onto your hand and gently massage it into their coat with your fingers. Remember that shampoo goes a long way and you can always add more. If you use too much, it will be difficult to rinse out. Don’t forget their tail, legs, and feet! Make sure you lather them up really good all over. When getting their legs and belly, keep a soothing hand on their back so they do not try to jump out of the water. They could really get hurt. Once your puppy is lathered up and ready for rinsing, you may need to drain the soapy water out of the tub or sink. That is just fine. You can use your jug or cup that you brought with you to rinse the coat. If you have a shower head, you can use that to rinse the coat as well. You want to make sure your puppy does not get cold and start to shiver, so if draining the tub takes too long, do not wait for it to be completely drained before beginning the rinsing process. Next, you will want to wash your puppy’s head. Use the jug or cup and gently pour warm water over the puppy’s head from behind the skull avoiding their face. While you are doing this, tip the puppy’s nose upwards so when you pour the water on it’s head, it will not go into their eyes or nose. It is not generally necessary to wash their face, but if they are considerably dirty, you can use a very small amount of shampoo on your finger tips and make a lather in your hands to disperse onto the face. Rub the shampoo into your dogs face and neck always avoiding the eyes and mouth. Then use the jug or cup and rinse the head again with warm water using the same method as before, and towel dry their face and head. Now you are ready to remove them from the tub or sink and dry them off. Remove them carefully from the tub or sink and wrap them in a towel with their head exposed. You can use your hands to rub their body, legs, tail, and neck to help along the drying process. You do not ever want to use a hair dryer to dry your puppy. This is dangerous because you could very easily burn them. It is best to just allow them to dry on their own. Once you have completed the bath, you can let them out of the bathroom or room you were bathing them in and let them run and shake off. I recommend keeping them in a warm room until they are dry. Do not immediately let them outside or they may get dirty right away, or even roll in the dirt to get dry. This would obviously be counterproductive since you just got them clean. I suggest keeping them in one room during the drying process so they do not shake off in every room in the house. Generally a puppy will run around shaking off until they are dry. This is a new experience for them, so they are probably pretty excited. Make sure you give them lots of praise during the entire process. We want our puppy to feel calm and confident. The earlier you start conditioning them for bathing, the easier it will be in the future when they grow into large, adult Rottweilers. We want bathtime to be considered a normal routine that results in lots of praise and treats so they will not have a problem with being bathed in the future.